As many readers of this blog are aware, I’ve been actively searching for ivorybills since 2007 and have been obsessed with foraging sign and cavities since my first days in the field. Over the years, I’ve looked at bark scaling and cavities both in and out of suspected ivorybill territory and have developed and refined a hypothesis about what constitutes diagnostic ivorybill foraging sign. I have come to believe that no such diagnostic category exists for nest or roost cavities, although size, shape, and other contextual elements can support a suspicion that a given cavity is an ivorybill nest or roost. 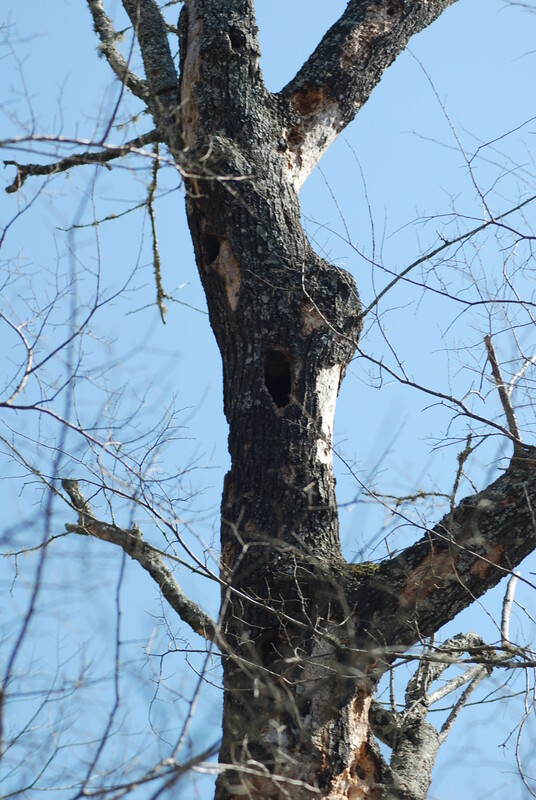 The cavity cluster we found in May 2014 has characteristics that are encouraging – size, shape, tree species, bark scaling in the vicinity – and one of the cavities resembles a known Ivory-billed Woodpecker nest. This is more than ample reason to survey the surrounding area very carefully (and I’m eager to get back out there), but whereas I feel personally confident that the dramatically scaled hardwoods in our search area were fed on by IBWOs, the mere presence of intriguing cavities is nowhere near as compelling for me. Similarly, while I suspect that Frank Wiley found a recent nest and at least a couple of roost holes in our old search area, this view is informed more by the associated conditions than by the qualities of the cavities themselves. 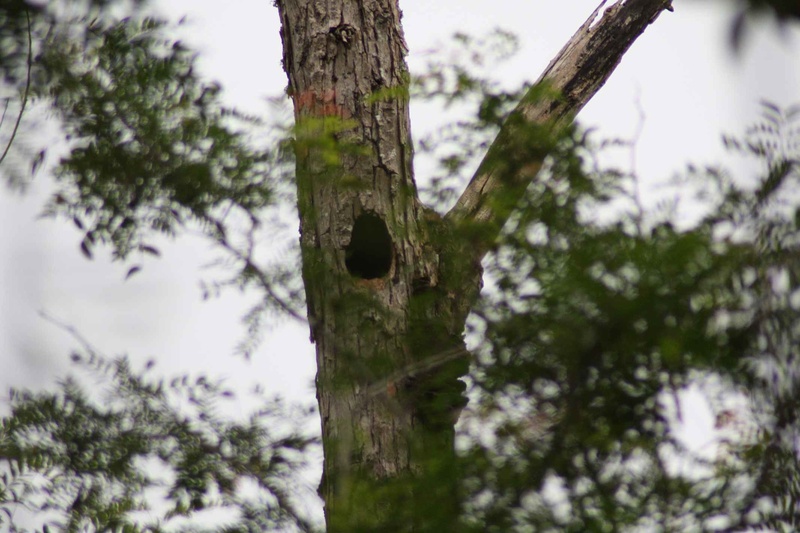 The suspected nest was in a tree that was heavily scaled and excavated in a way that was strikingly similar to a nest tree found in the Singer Tract, and this is more important than the size and shape of the cavity itself. The two suspected roost holes were in close proximity to one another, and were certainly large enough, but were dramatically different in appearance. There are several facts that are more significant than size or shape. We had a camera trap that covered both trees for a period of several months, and no Pileated Woodpeckers were photographed using the trees in question; the only image we obtained was suggestive of ivorybill but inconclusive (no images of either species were obtained from the suspected former nest tree, even though there were active PIWO roost cavities within 20 or 30 yards); in addition, we found an abundance of feeding sign in the area and had multiple auditory encounters and possible sightings within a few hundred yards of the suspected roosts between August 2009 and April 2010. Willow Cavities, East-Central Louisiana 2009. Photos by Frank Wiley. 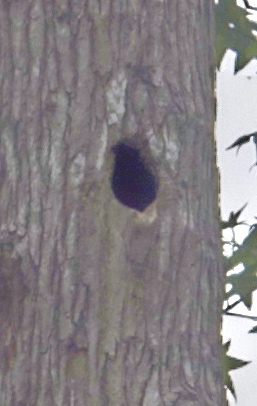 In examining the images of the suspected roosts and comparing them with other images of woodpecker cavities, I came across a photograph of a Crimson-crested Woodpecker (Campephilus melaneoleucos) near a cavity and was struck by the fact that it was almost identical in appearance to one of our suspected roost holes. I did some further research and found an image of a Pileated Woodpecker nest that was quite similar, if not quite as close a match. All of this leads me to think that, while it’s important to look for suggestive cavities, this should not be the top priority. I’d encourage other searchers to focus on feeding sign, habitat characteristics, and local reports above all. The limited available information suggests that feeding sign is what led Allen and Kellogg to the Singer Tract birds and that it’s what Kuhn and Tanner looked for. Pileateds will use big cavities (and I’ve even seen White-breasted Nuthatches nesting in holes that look perfect for ivory bills). While finding a nesting or roosting ground will be central to documenting the ivorybill if it persists, cavities alone will not point the way.